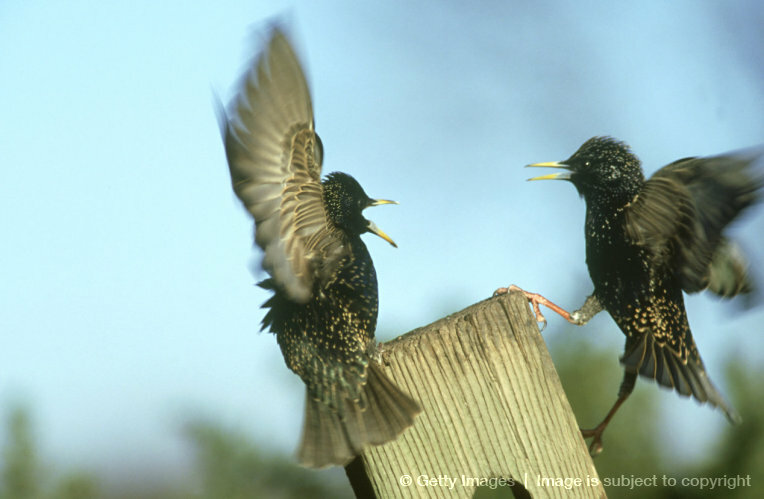 "Blackbirds" are actually called Starling and Grackles. These birds were introduced to the U.S from Europe by an individual that wanted to have the birds mentioned in Shakespeares plays to be in America. Released into New York City in the 1800s, this bird is now established throughout the continental U.S., Alaska, and Hawaii. Traveling in large flocks they are serious pests to grain elevators, corn fields, orchards, cattle and hog feed lots, as well as homes and businesses in the city and can number in the hundreds of thousands. They can cause serious damage to trees, buildings, signs, marquees, and bill boards. 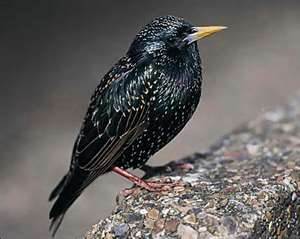 A small black, speckled, irridiscent bird, with a loud vocalization, the smell can be overpowering and the noise deafening when they appear in large numbers. 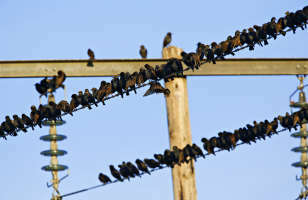 During daylight hours they will feed and loaf at different locations, but when evening approaches, the members of the flock will come together above the nightime roosting site and decend en masse. They feed upon insects, fruits, seeds, scraps, and garbage. 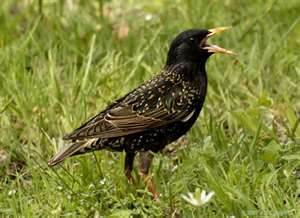 IF YOU DEVELOP A PROBLEM WITH THESE HIGHLY TERRITORIAL BIRDS. CALL IMMEDIATELY. THEY HAVE A HIGH REPRODUCTIVE RATE AND A SMALL FLOCK WILL BECOME A LARGE PROBLEM QUICKLY. ALSO THE LONGER THEY ROOST AT A SITE, THE MORE COMMITED THEY ARE TO IT AND THE TOUGHER IT IS TO GET THEM OUT. ACE SPECIALIZES IN THE USE OF NON LETHAL HARRASSMENT METHODS TO DISPERSE THESE BIRDS. ACE PROVIDES NON-LETHAL STARLING BLACKBIRD, AND GRACKLE REMOVAL SERVICES VIA THE USE OF HARRASSMENT, TRAPPING, TACTILE REPELLANTS, AND AUDIO/VISUAL DETERRANTS, FOR BENTON, BOSSIER CITY, BLANCHARD, ELM GROVE, GREENWOOD, HAUGHTON, KIETHVILLE, MINDEN, MOORINGSPORT, SHREVEPORT AND STONEWALL. birds taking over the exterior of your house? birds taking over your business signage? tired of paying for customers car washes? smell of bird droppings driving you crazy?